It's time for round two of Vermont Roulette, wherein I purchase random Vermont beer that I've never heard of, drink it, and see if I survive. While round 1 was not tremendously successful, I did live to play again and this time, I think I've stumbled onto something rather good. I purchased this at the Warren Store, and when I asked the guy about it, he said he hadn't tried it yet, but that it was brand new and that the brewery really just got started. Looking around ye olde internets reveals that the location has been around for a while, but that distribution is starting to expand. Or something like that. It used to be called The Shed, a pub built on an old youth camp called, yes, Camp Idletyme. The beer itself is a svelt 8% ABV DIPA with what seems like a relatively light malt bill and lots of "new" aroma focused hops. According to the brewer, they're still experimenting with the dry hop varieties (you know the story, small breweries can have a difficult time contracting for hops, especially the popular ones), but to my mind, they're on the right track. Good tymes! Beer Nerd Details: 8% ABV bottled (22 oz bomber). Drank out of a Willibecher glass on 8/30/14. So there you have it, a solid DIPA that's bound to be underrated due to the gravity well of more famous Vermont beer. Worth a shot if you can find a fresh bottle (I get the impression that this beer would age poorly, even moreso than a lot of other IPAs), and I assume it's just as good on tap. So an unqualified success for Vermont Roulette. At least one more round coming, another relatively new brewery's take on an IPA. So a couple years ago, the Lost Abbey started a series of beers inspired by rock music that was themed by heaven or hell (as befitting the Last Abbey's general brand). Each month, they released a new "track", a special edition beer available only at their tasting room and limited to just 450 bottles each. These are exactly the sort of beers that an east coast dork like myself could never dream of acquiring. 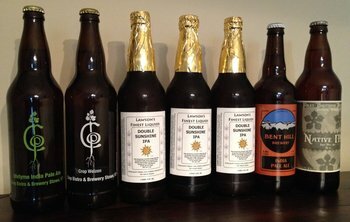 But at the end of the year, Lost Abbey did a "Box Set" of all the beers, and some seemed popular enough to brew again. 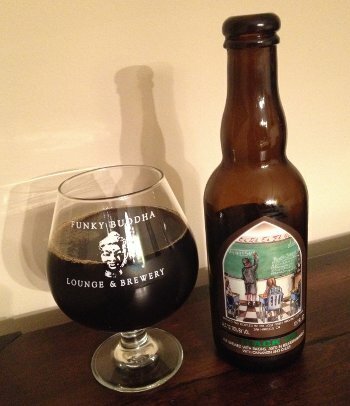 Beer Nerd Details: 13.7% ABV bottled (375 ml caged and corked). Drank out of a snifter on 8/23/14. Vintage: 2014. Yet another winner from Lost Abbey. Someday, I'll need to get around to trying Cuvee De Tomme or Duck Duck Gooze, but until then... I'll just have to deal with all this other beer I have laying around. When it rains, it pours. No sooner than I got back from my trip to Vermont, a friend got back from her trip bearing tidings of Three Floyds, so now I find myself flush with amazing hoppy beers. Beer Nerd Details: 9% ABV bottled (22 oz bomber). 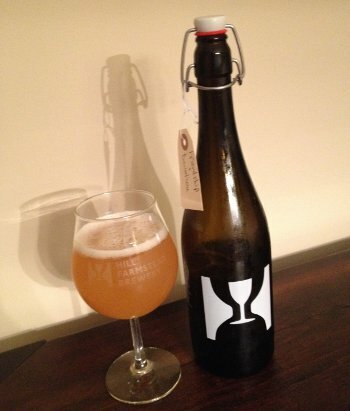 Drank out of a Hill Farmstead Charente glass on 8/23/14. 100 IBU. Bottled 7/25/14. 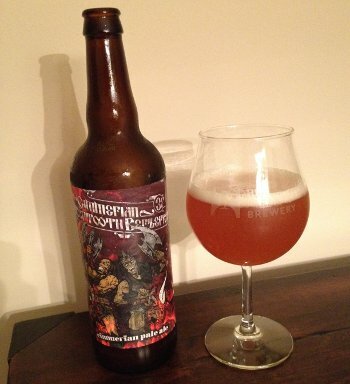 Certainly not my favorite Three Floyds DIPA, but then, they apparently have a ton of them, and you'll be seeing some more of them in the coming weeks. Stay tuned. I'll take a break from relentlessly bragging on my Vermont beer trip* to bring you a few whiskey reviews. A pair of these are from the same samples sent to me by spirits compatriot Dimitri (the guy who sent me that Duvel Distilled), so many thanks need to, again, be showered upon him for his generousity. I'm also going to review what is possibly the best Bourbon I've had yet in my admittedly paltry tenure as a whiskey dork. Whiskey Nerd Details: 90 proof, 45% ABV bottled (750 ml). 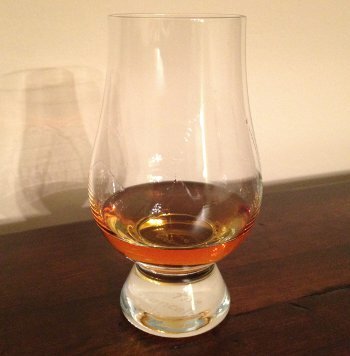 Drank out of a glencairn glass, bottle nearly finished (but only a few months old). Beer Nerd Musings: To my knowledge, there are no bourbon barrel beers that specifically call out Elmer T. Lee barrels, though naturally Buffalo Trace supplies many barrels to brewers for that purpose. I'm sure this has shown up in the blend for lots of beers, and I get the impression that higher spice works well with bourbon barrel beer. I could be talking out of my arse on that one though. For my part, I would consider using this in my next bourbon oaked homebrew (though I still need to figure out what to do with my barleywine, which is still having carbonation issues). So these next two may be unfair to review at the same time, but I will note that I had these on separate occasions, so there is at least that. These are both thanks to Dimitri, so once again, thanks man! Whiskey Nerd Details: 92 proof, 46% ABV bottled (sampler). Drank out of a glencairn glass. Whiskey Nerd Details: ? proof, ? ABV bottled (half sample). 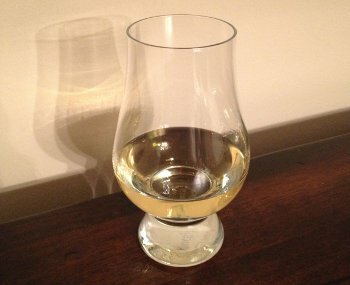 Drank out of a glencairn glass. So there you have it, and don't worry, we'll get back to beer tomorrow. But I may mix things up in the coming months with some reviews of other stuff, as I've found it illuminating. * Editor's Note: Is that really worth bragging about? My Response: I'm the worst. This has been established. But, you know, reviews on obscure Vermont beers coming soon, so don't change that dial. 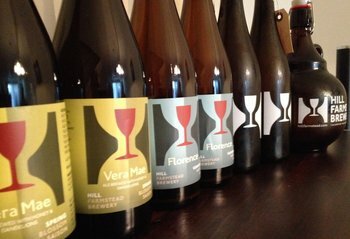 We love Hill Farmstead here at Kaedrin, so when we took a slight, uh, 9 hour detour into Vermont to nab some of their prized beers, we availed ourselves of everything we possibly could. While I'm not a particularly huge fan of growlers, I absolutely had to fill up my limit whilst I could. Growlers are not known for their longevity but fortunately, these are beers that do not last long in this household. First up, Harlan, a beer I cracked open for a little scenic drinking just a few hours after returning from my trip. Beer Nerd Details: 6.3% ABV from a growler (fancy 2L swing top). 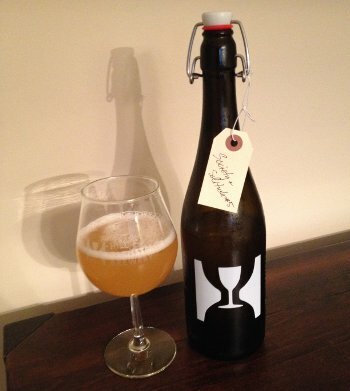 Drank out of a Hill Farmstead Charente glass on 8/14/14. Growler filled on 8/14/14. Beer Nerd Details: 8.4% ABV from a growler (750 ml swing top). 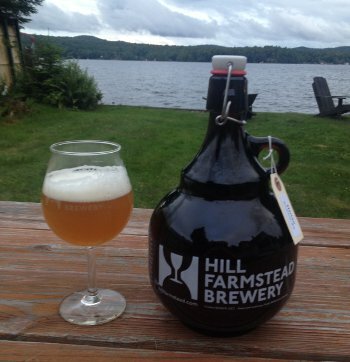 Drank out of a Hill Farmstead Charente glass on 8/16/14. Growler filled on 8/14/14. Beer Nerd Details: 6.6% ABV from a growler (750 ml swing top). Drank out of a Hill Farmstead Charente glass on 8/16/14. Growler filled on 8/14/14. So there you have it. I'm getting pretty close to exhausting Hill Farmstead's standard brews. Someday, I may have to fill a growler with something I've had before, like Abner. The horror! Already looking forward to it! Beer Nerd Details: ? ABV bottled (22 oz bomber). Drank out of a tulip glass on 8/18/14. 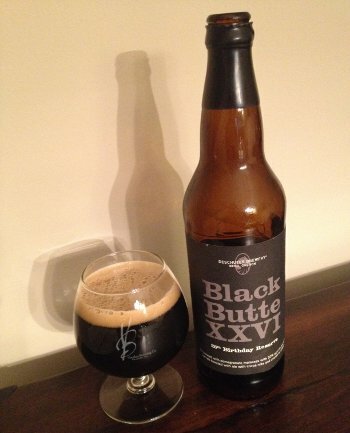 Bend, Oregon brewers at Deschutes started their brewery off with a pretty standard porter for a flagship beer. In the current craft beer bonanza, this wouldn't be that unusual. Boring, even. But considering that Deschutes opened 26 years ago, this was actually a bold choice. Fast forward twenty years, and they could see that it was the right choice. That's when Deschutes started brewing up a special anniversary beer to celebrate their success. They took their old flagship, amped it up a few notches, chucked in some adjuncts (different every year, but usually including chocolate), and aged a portion in old Bourbon barrels. 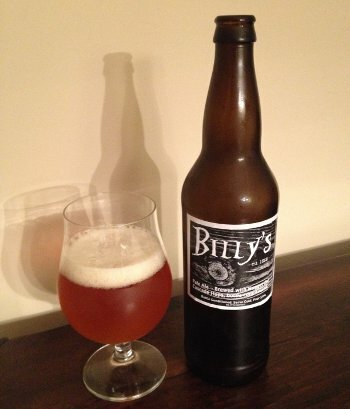 Beer Nerd Details: 10.8% ABV bottled (22 oz waxed cap). Drank out of a snifter on 8/8/14. Best After 06/16/14. I still can't help but wonder what a full BBA version of this (or their famous Abyss) would be like, but I guess that's not to be. As it is, this winds up being rather unique, so you can't fault them for that sort of thing. Also, someday I'll remember that Deschutes uses a "Best After" date on their big beers like this. * If I actually knew what a butte was, I would have totally cooked up some mashed potatoes and gone all Richard Dreyfuss on that stuff. In fairness, a nice plate of meat and potatoes would probably be a decent pairing for this, so it's not a totally unrelated reference. Well, probably not, but work with me here. Last week was my now annual trip to Adirondacks to join family and friends for lakeside merriment and generalized fun (incidentally, this is why there were no posts last week). 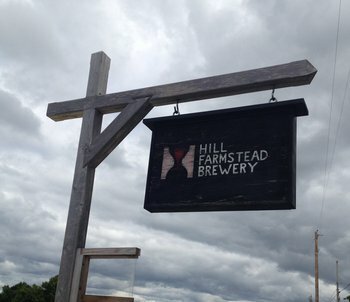 As with last year's Operation Cheddar, I took a little day trip over to Vermont to secure hallowed libations from the holy trinity of The Alchemist, Lawson's Finest Liquids, and Hill Farmstead. The plan was pretty much the same as last year, except that The Alchemist was no longer distributing direct from their cannery, instead distributing to a variety of local Vermont establishments. Alas, this little switchup would prove to be my doom. Or, well, just make it so that I didn't manage to procure any precious Heady Topper. I suppose I could have, but I opted not to wait the extra two hours. I've had plenty of Heady in my day, including a recent fresh 4 pack, so I didn't judge this to be a huge loss. I could probably have found the odd 4 pack around somewhere, but this whole distribution situation makes this sort of day trip a little inconvenient. I'll need to do a more dedicated Vermont trip to make this work. No big whoop, onwards and upwards. So aside from Double Sunshine, I grabbed a Foley Brothers Native IPA (I enjoyed their brown ale from last year's sortie), a Bent Hill India Pale Ale (dude at the shop said they're brand new and at the time, no reviews on the internets), a Crop Bistro & Brewery Idletyme IPA as well as their Crop Weizen (another brand new brewery). Also procured at The Warren Store was some Vermont Maple Syrup and a wonderful breakfast sandwich, which I ate in peace out on their deck that faces the little waterfall and creek on the side of the building. Good times. Once again, I ended up buying some of the same beer as last year. But when that beer is Vera Mae, I'm not going to complain. Plus, I got my hands on an ample bounty of Florence (more than pictured), and growlers of Harlan, Friendship & Devotion, and Society & Solitude #5, so there is that. 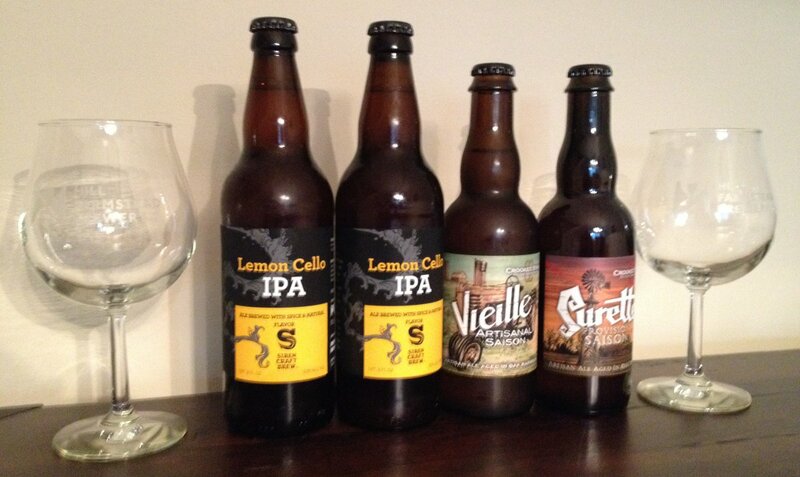 Also snagged some Siren / Mikkeller / Hill Farmstead Limoncello IPA and Crooked Stave Surette and Vieille. Oh, and they had glassware this year too! The last stop was Winooski Beverage, where I had hoped to score some Heady Topper. Alas, I got there at 4, there was already a few people waiting in line, and they weren't going to start selling until 6. I still had a three hour drive to get back home, so I opted to grab a few shelf turds (that happened to all be Massachusetts beers) and leave it at that. 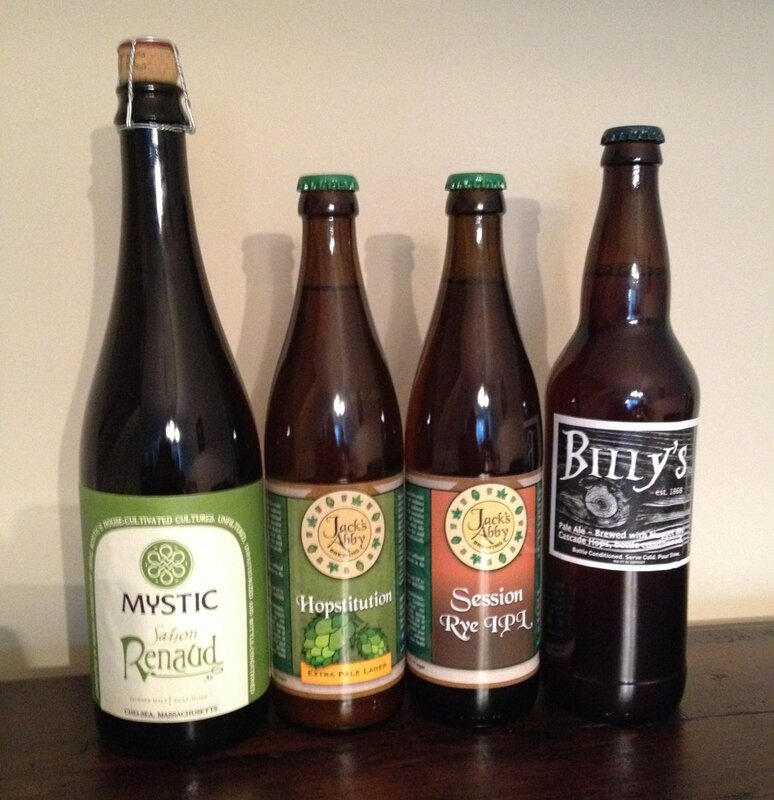 Let's see what we got here: Mystic Saison Renaud, Jack's Abby Hopstitution IPL and Session Rye IPL, and something that looks like homebrew (seriously dude, it's got those Brewer's Best caps) called Billy's Pale Ale. 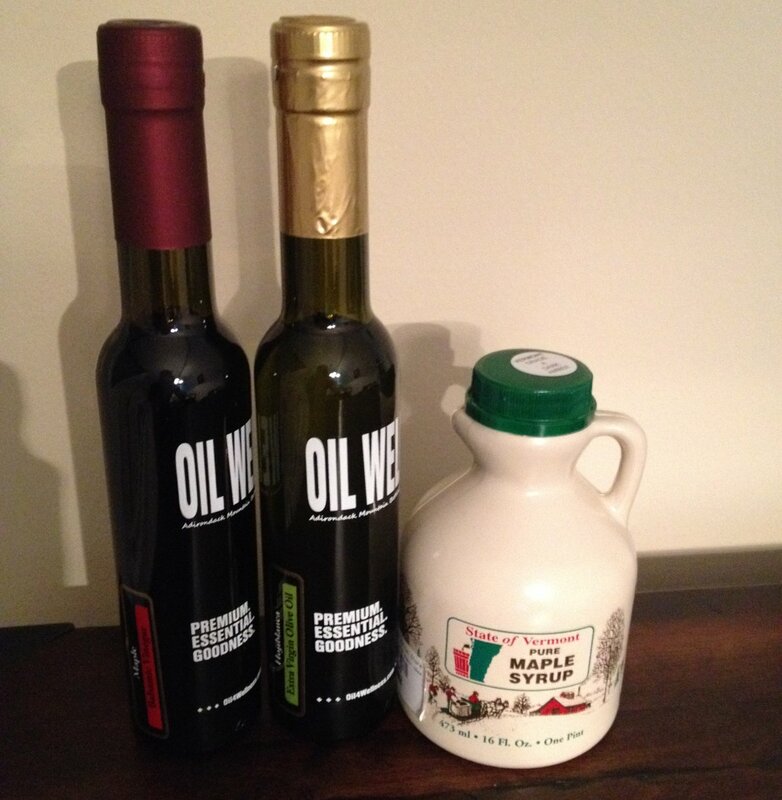 And just for fun, some other stuff I procured on this trip, including some great tasting Olive Oil and Balsamic Vinegar, along with that Maple Syrup that I mentioned earlier. So yes, despite the lack of Heady, I declare that this mission has been accomplished. Until next year (though fingers crossed for a more wintry excursion in a few months). While beer is obviously my main squeeze, I do like to dip my toes into other realms of boozy glory. 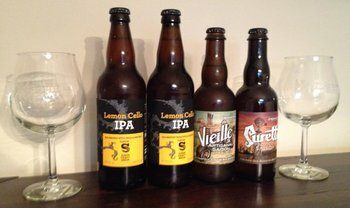 I'm far from an expert in these other worlds, but that's part of the fun, and it turns out that there are a lot of intersections between beer and other libations. Witness my near obsession with beer aged in wine or spirits barrels. But there are other intersections beyond that... one of which is distilled beer. 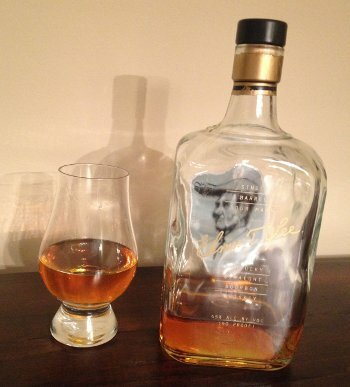 I read a fair amount of beer blogs, but I also check in on a fair amount of whiskey bloggers. One of my favorites is Sku's Recent Eats, and as it turns out, he has a penchant for distilled beer. 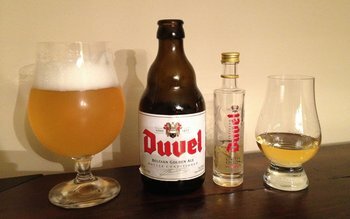 This has always intrigued me, so when I saw his recent post on Duvel Distilled, I commented that I'd love to try the beer and the distilled version together, just as an experiment. Well it turns out that the fine gentleman who sent Sku his samples saw my post and arranged to send me some samples as well. A month later, and I get to partake in that experiment. Many thanks to Dimitri for sending me this sample (and a few others, which I'm sure I'll post about at some point as well). I've had a somewhat rocky relationship with Duvel in the past. I was distinctly unimpressed the first few times I had it, but I've had it twice in the past year and in both cases, it turned my head. Perhaps I had gotten bad bottles before. Whatever you may think of this, Duvel is generally known as the quintessential ur-example of a Belgian Strong Pale Ale (this is a pretty generalized category, but that's Belgian beer for you). I'm no expert on this aspect, but as fodder for distillation, Duvel doesn't seem particularly well suited. 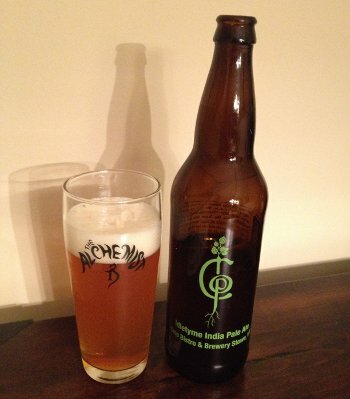 It's mostly pale barley malt and very lightly hopped with mild European hops (i.e. very little inherent flavor from those ingredients). Instead, Duvel gets its distinct character almost entirely from the Belgian yeast - huge fruity esters and spicy phenols, with a high attenuation (resulting in a highly carbonated, dry beer). So what we have here is distilled Duvel that is then aged for six years in bourbon and sherry barrels. It's apparently somewhat rare and highly sought after, so it seems extra thanks should be sent Dimitri's way. I know from reading Sku's posts that heavily hopped beers retain their hoppy character in the finished product. So the question is whether or not Duvel's yeast character will survive the distillation and aging process. Alas, it appears the answer is "not really". Beer Nerd Details: 8.5% ABV bottled (11.2 oz). Drank out of a tulip glass on 8/6/14. Now if I can just get ahold of some of that Charbay whisky (distilled from Bear Republic's excellent flagship Racer 5 IPA), things might turn around. And some day, I really want to try New Holland's Beer Barrel Bourbon (which is bourbon finished on a third use barrel, with the first use being Bourbon and the second use being New Holland's Dragon's Milk Imperial Stout). I've been hitting the local brews pretty hard this past week or so, and I don't see any reason to stop now. 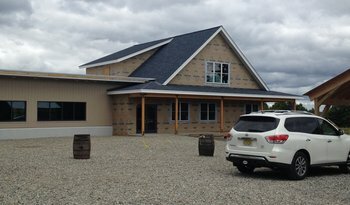 Here we have another two year old local brewpub specializing in English and Belgian styles, with a particular focus on saisons. As I've mentioned before, they share a fair amount of DNA with what makes Tired Hands a Kaedrin favorite, so you know I'm interested when they do a bottle release. They're a bit further away from me, so I don't always get up there for bottle releases, but on the other hand, they tend to be low stress affairs, much like the laid back atmosphere they cultivate. Beer Nerd Details: 6% ABV bottled (500 ml waxed cap). Drank out of a flute glass on 8/2/14. Batch 2 (I think... definitely the second bottling), bottled May 21, 2014. 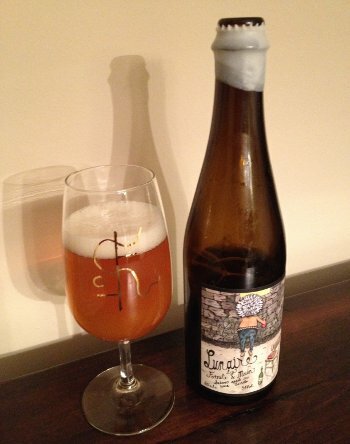 I seem to be drowning in excellent, funky, local saisons aged in wine barrels of late. I'm not really complaining about that, I love me some farmhouse and I've been trying to live off my cellar for the past few months instead of continually buying more than I could even drink, but I also try to write about more diverse stuff. I'll have to see what I can do in the near future about that. Incidentally, I've got a line on some midwest Gold, and even a potential trip to Vermont next week, so I'll most likely be stocking up again in the near future. Stay tuned! * For the non film nerds amongst you, I was trying to evoke the early cinematic classic Le Voyage dans la Lune (aka A Trip to the Moon)with that quip, but the fact that I'm even writing this footnote is probably a bad sign, no? I'll just stop then.